The quince is a small, deciduous tree that bears a pome fruit, similar in appearance to a pear, and bright golden-yellow when mature. The fruit is edible when cooked and there is a long history of this, but the tree is also grown for its attractive pale pink blossom and other ornamental qualities. The tree grows 5 to 8 metres high and 4 to 6 metres wide. The fruit is 7 to 12 centimetres long and 6 to 9 centimetres across. It is native to rocky slopes and woodland margins in South-west Asia, Turkey and Iran although it can be grown successfully at latitudes as far north as Scotland. It should not be confused with its relative, the Flowering Quince. Quince, Cydonia oblonga, is the sole member of the genus Cydonia in the family Rosaceae. The immature fruit is green with dense grey-white pubescence, most of which rubs off before maturity in late autumn when the fruit changes colour to yellow with hard, strongly perfumed flesh. The leaves are alternately arranged, simple, 6–11 cm long, with an entire margin and densely pubescent with fine white hairs. The flowers, produced in spring after the leaves, are white or pink, 5 cm across, with five petals. 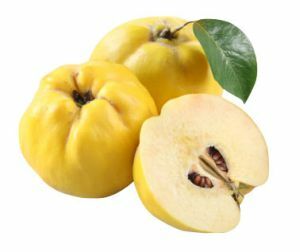 Quince is low calorie fruit. 100 g fresh raw fruit provides 57 calories. In addition, it composes several vital poly-phenolic antioxidants than apples and pears. The fruit is the storehouse for phyto-nutrients such as dietary fiber, minerals, and vitamins. Although not well documented, quince fruit, like pears, has anti-allergenic and anti-inflammatory properties. The fruit as well its seed's extraction is suggested in the treatment of cystitis, atopic dermatitis, recommended by health practitioners as a safe alternative in the preparation of food products for allergy sufferers.